The perfect Thanksgiving wine is good wine. And we have plenty of that. Seriously, don’t fret over finding the perfect wine to pair with dinner. If you find yourself stressing out about wine, you should probably drink a little more wine — responsibly, of course. Thanksgiving is about celebrating the bounty of the harvest with family and friends, and sometimes watching huge men in tight pants impose bodily harm upon each other on a football field. Sparkling wine pairs with all of these things. If you insisted on a general wine pairing for everything on your table, besides Champagne or Cava, we’d probably steer you toward a rich Verdejo from Rueda, Pouilly-Fumé, or even Costers del Segre for Riesling, and Pinot Noir from Burgundy or Gamay from Beaujolais for red. While we’re not going to suggest a specific wine for your Thanksgiving dinner, we do want to turn you on to a medium-sweet, fortified wine that we think will resonate with just about everything on the dessert table, as well as liver pâté and intensely flavored cheeses, much in the way of Sauternes. We’re talking Pineau des Charentes. The geographical zone authorized for the production of Pineau des Charentes AOC is practically identical with that for Cognac. But if you’ve never heard of it, the reason is probably due to the fact that ninety percent of the Pineaux that’s made in the Charentes region is consumed in the Charentes region. Of the remainder, approximately eighty percent goes to Belgium. There’s precious little Pineaux left to export to the U.S.
Sourced and bottled in minute quantities, Paul-Marie & Fils Pineau des Charentes Vieux is a White Pineau des Charentes made by adding Grande Champagne Cognac (the highest level Cru within Cognac) to lightly fermented sweet grape must. Alcohol level is maintained at 17% by volume to inhibit further fermentation. The exact origins behind this particular bottling are unclear. What we do know is that it is certified “Vieux”, meaning that, by law, the blend must have been aged in oak casks for a minimum of five years. Apparently, this certification was obtained years before the actual bottling, so it’s possible it’s closer to “Tres Vieux”, or 10 years of cask aging. The particular composition of grapes is also unknown but most likely 100% Ugni Blanc. What we know for sure is that there were only 700 bottles produced and numbered, and that we have a large percentage of that tiny amount. And we know that it is a remarkable drink, colored a vibrant tawny, verging on copper, and overflowing with aromas of dried fruits and honey. The sweetness is balanced by a deep acidity layered through with a soft nuttiness. It ought to transform the obligatory slice of pumpkin pie into a magical experience. 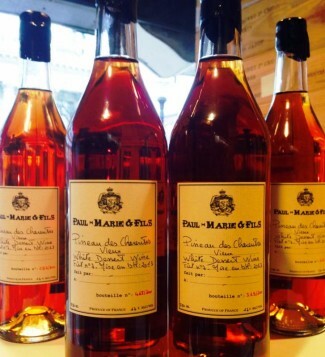 Paul-Marie & Fils Pineau des Charentes Vieux will also make a fine gift for the Cognac drinker, the cigar smoker, a housewarming, and especially a holiday potluck dinner. We’ll even wrap it up pretty for you. Stop by the shop on Saturday to have a taste.